Once the paper-thin veil was punctured, which happened over and over again, life and death became indecipherable from one another. Metaphorically, this is the sense any devastating tragedy imparts, such as how 2011’s Great East Japan Earthquake and Fukushima Daiichi nuclear disaster seemingly affected artist Hikari Shimoda. While her work had previously depicted stoic children, in the aftermath of these events Shimoda’s creations became vessels to fill with symbolism, her blank slate characters newly brimming with subtle but meaningful touches. Animal-like manifestations, like horns and bear ears, express their anger and despair at this chaotic world, their star-filled eyes twinkling with wishes for something better. Motifs such as burning houses erupt on the canvas, implied reminders of desolation and destruction, a sheet-covered ghost hauntingly conveying a sense of isolation and depression. And these are the emotions felt in Shimoda’s sophomore sculptural collaboration with APPortfolio, following 2017’s Children of This Planet (learn more here), the aptly titled Lonely Hero and Obake. Wrapped in his superhero-ish garb, Lonely Hero is a reoccurring facet of Shimoda’s art, this savior character destined to save the world from humanity and all the wrongs that mankind have caused. Perhaps sullen due to this realization, the young boy has collapsed like a marionette with cut strings, his legs splayed in woeful resignation. Desperately grasping onto the spectral Obake, whose name is Japanese for “ghost”, Lonely Hero seemingly combats loneliness by clutching to whoever he can, even if they are already departed, such as this spirit that represents the human race. Able to be interpreted as a powerful statement about being unable to let go of the past, the sculptural Lonely Hero and Obake polystone form is inspired by an untitled watercolor painting that Shimoda displayed at The Cotton Candy Machine in 2014’s Niji Bambini exhibition, this 11⅗-inch tall rendition presented in the 300-piece, sweetly pastel-toned Polaroid edition that counters her darker intentions. Having debuted at the 2019’s Shanghai Toy Show, this version debuted alongside the 118-piece Birch edition, the shape cut and hand-polished out of imported Indonesian wood. Foregoing the lustrous colors frequently associated with Shimoda’s art, the exposed grain texturing of this rendition provides a wholesome aura to the work. And by constructing it out of a thoroughly natural material, it conveys a sense that the imagery’s message is that of the natural order, that only mankind’s downfall will right our wrongs. Whether this premonition is a possibility or certainty remains a mystery, but this sincere warning from Shimoda may grant us the chance to correct the course before it is too late. 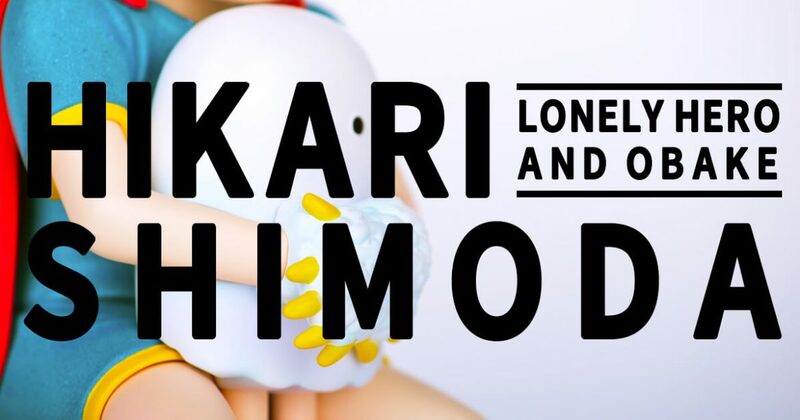 Click Here to Acquire Hikari Shimoda’s Lonely Hero and Obake.